This pattern is very near and dear to my heart. For a long time, I told myself that this was MY pattern and I didn’t want anyone else to have it, but they are just so dang cute and ferocious that I need to share it. 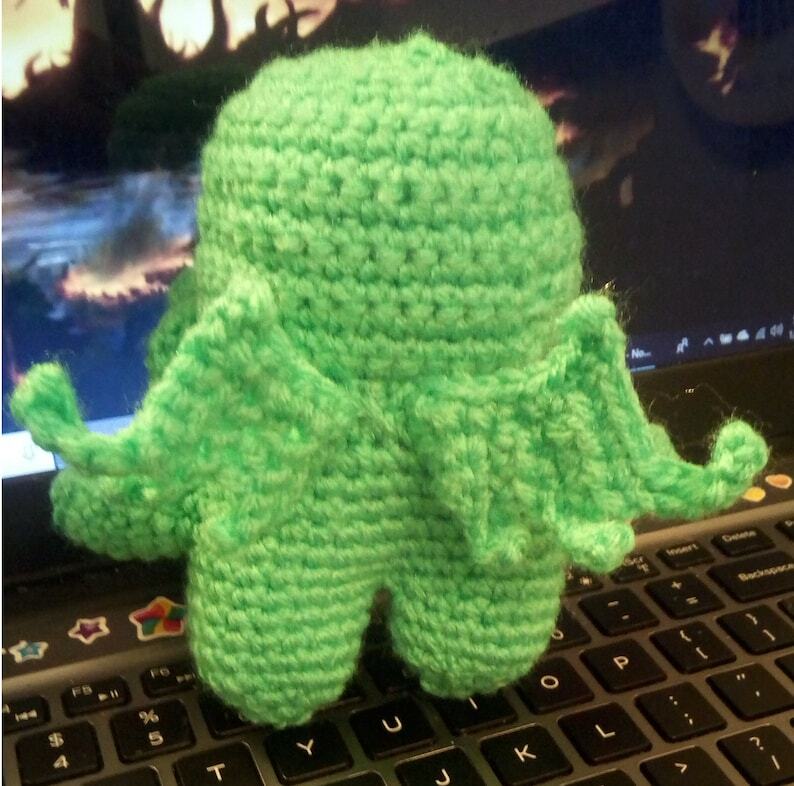 Years ago a friend of mine from university made a special request to have a mini Cthulhu custom-ordered. The first one I ever made was a little wonky, but still cute. I revised the pattern over multiple attempts and finally got it the way I wanted. A mid-size plush with oversized eyes, bigger wings, and curly-crazy tentacles. The very first Cthulhu that started them all. A little disproportionate, a bit small, but still adorable. My Cthulhu received immediate fame on forums and fandom boards on Reddit and Imgur. (My Jumbo Cthulhu earned me a viral-trending badge on Imgur for receiving over 40k views). I sold a bunch of them for Christmas gifts to locals from the Fraser Valley and out of an amazingly-nerdy shop in Downtown Abbotsford, Nerd Haven Games. After having so much fun keeping this little gem to myself, I’d love to share it with all of you. Introducing, the most fearsome beast in all the universe, the ever-powerful, and somehow the most adorable, Mighty Cthulhu Plush. This amigurumi pattern is for intermediate crocheters who are comfortable working in the round, shaping flat pieces, and assembling different pieces. I buy mine from this supplier and they never disappoint! Want some tips and tricks to improve your amigurumi skills? Read my blog post with my top 5 tips for creating the perfect plush! Note: There are 3 different types of tentacles. I am going to write out the instructions for the two rounds that include tentacles, but please see the section “Tentacles” to learn how to crochet each type. Insert your safety eyes now. I inserted mine in the 10th row over the two outside tentacles. Stuff your head as much as possible! Round 19: Dec around and fasten off. Weave in your end. Prior to seaming, make sure all pieces are stuffed to your liking (the arms and body). The first join will be the head to the body. Using the yarn from the body, run a simple slip stitch joining the head to the body. I like to position the head slightly forward, so the back of the head and the back of the body are more in line. This provides more room at the front of the body for the tentacles to hang comfortable without being pushed forward by the body. Join the arms to the side of the body, near the top of the body where the seam for the head is located. The wings are the tricky part. I sewed them on flat so they would hang with the individual tips pointing down near the outside edge of the body. To keep your wings upright run a stitch that joins the wing to the underside of the head/top of body wherever is comfortable. This is optional, but I found it helped to keep the wings in a better place so they couldn’t flop all over. Weave in all of your ends and you are done! Ta daa! You have created the most fearsome beast in all the land, the mighty, and somehow adorable, Cthulhu! Now, go and impress your friends with your work of amigurumi art. As always, I love to see your work! Please tag me in any pictures or posts of your Cthulhu plushies so I can admire your handiwork. Also, please credit this pattern where it is due. I was never going to release this pattern, so now that I have, I want EVERYONE to have it! Let me know in the comments below if you have any questions about the pattern. Happy crocheting! Can you please tell me how tall these are? for the head, row 6 to row 7… how do you go from 36 stitches in round 6 to 42 stitches in round 7 if youre only single crocheting in round 7? When you look down the legs section it shows where you connect the legs, and I assume the rest of the “legs” section is the body. However, I too am confused about the jump from 36 stitches to 42? @stringsandthingss, please help!! There was one line missing at the beginning of the pattern which I missed ,and I apologize for that! If you go back and check now it will add up to 42. You’re right, the legs continue into the body. You don’t this pattern is riddled with errors and mistakes, I am rewriting it. The mistakes start in R3 of the head and continue throughout. The body is completely missing in this pattern as well. Thank you for bringing that to my attention in R3! I have gone through and adjusted/fixed the pattern. If you read closely, you’ll see the legs section actually contains the body. I have updated that section to say “Legs & Body” just so there is no more confusion. I worked in the round and didn’t join and turn. Just marked each row as I went. Yes, thank you so much! Those were the numbers I had as well, looks like I forgot to add them into the notes. I apologize, there was one line missing from the beginning of the pattern. I have corrected it and now the math all works out perfectly to end with 42 stitches going around for the head. Sooo many mistakes and they start in R3 of the head. You cant increase from 12 to 18sc if you do” sc2,inc”around. It HAS to be “sc,inc” around. Please proofread and practice the pattern you write out to make sure it actually works before publishing. While once I fixed all the mistakes it made a cute Cthulhu. Having to fix the mistakes after completing the round and not having the needed stitches is beyond frustrating! Sorry you were frustrated with it, but obviously you were able to figure it out so that’s great news! I have updated the few errors in the pattern, looks like I accidentally omitted the *sc 1, inc step, but it is in there now. I’m having real difficulty with the wings . Is there a photo of the shape tney are supposed to be? The wings are definitely the trickiest part! You word side to side, making each little “prong” of the wing every two rows (hopefully that makes sense). There should be an image of the back of one of the completed Cthulhus to see what the wing shape looks like. Let me know if that helped at all! Row 7: sc 9, ch 3, turn. You are now at the very top, outside peak of the wing. Row 7 is the outside edge of the wing.The tail you left at the other end is the inside edge of the wing, where it attaches to the body. Row 8: Sc down the TOP side of your wing (NOT down the outside edge of the wing, AKA Row 7). Fasten off and leave a long tail for seaming.